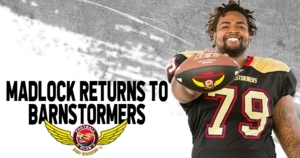 DES MOINES – The Iowa Barnstormers have re-signed offensive lineman Corey Madlock to the 2019 roster, Head Coach Dixie Wooten announced today. Madlock (6-4, 305, Tennessee-Martin) returns to the Iowa Barnstormers for his second season with the team. Madlock first joined the Barnstormers in May of 2018, appearing in four regular season games. Madlock also contributed to the Barnstormers’ United Conference Championship and United Bowl Championship victories. Collegiately, Madlock played at Bowling Green State before transferring to the University of Tennessee-Martin in February of 2016. Madlock appeared in 19 games during two seasons with the Skyhawks. Season Tickets for the Iowa Barnstormers 2019 season are available now! For as low as $80 per seat, fans can enjoy the action from the same great seat location each game. Fans who order before August 31 will receive special early bird pricing. For more information, call the Barnstormers at (515) 633-2255 or log on to www.theiowabarnstormers.com.